Of the numerous San Diego teams to have a New Era cap produced, the San Diego Gulls have just recently become one of the more rare and sought after teams with a New Era cap. This wasn’t always the case; the recent scarcity is due to licensing. New Era has decided to allow their licensing deal with the NHL to expire as of March. With that expiration it was assumed that New Era would not produce anymore NHL 59Fifty caps, and that has held to be somewhat true; the newest 59Fifty caps I’ve seen are from NHL’s newest team in Las Vegas. 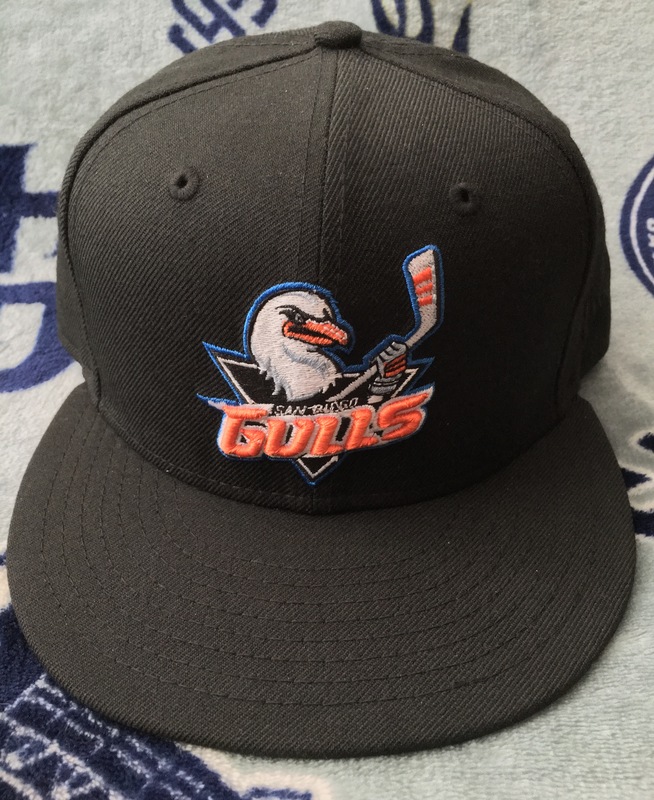 As the AHL serves as the farm system to the NHL, it’s safe to also assume that the stock of New Era Gulls caps will dry up as soon as they’re sold. This version of the San Diego Gulls is the 5th such hockey team in San Diego to use the moniker and are relatively new residents to Valley View Casino Center (I still call it the San Diego Sports Arena), only having moved in time for the 2015-2016 season. The Gulls play in the American Hockey League and serve as the farm team for the Anaheim Ducks. The cap is otherwise standard fare; the logo draws most of the visual interest and black can be worn with almost anything. Here’s a closer look at the Gulls logo up front. I particularly like the Gulls colorway; the blue is more of an electric blue and pops out with the orange to provide a great contrast to black and white. The Gulls mascot shown here is named Gulliver. The rear of the cap features the Gulls version of the SD. The underbrim and sweatband are standard black/black. Added to the usual brand and size tags is the American Hockey League logo tag. I only classify this cap as uncommon/rare since I’m not sure how many New Era examples are still available. Your best bets for a New Era version of a Gulls hat are through local vendors. I know a few versions may still be hanging around Hat Clubs in Mission Valley and National City. After spending some time in San Diego I can report that this cap can still be found at Lids in Fashion Valley and Parkway Plaza. I imagine Hat Club in Mission Valley and Plaza Bonita still have some as well.